Ask Chef Marc Murphy where he grew up and he’ll fire off a list of cosmopolitan destinations – Milan, Paris, Villefranche, Washington DC, Rome and Genoa – “and that’s before I turned 12,” he’ll explain. This dizzying list of hometowns served as an excellent education in French and Italian cuisine, though as a teenager this was not his first passion. When the reality hit that he didn’t have the funds to become a professional race car driver, Murphy followed his brother to the Institute of Culinary Education. Following graduation, he apprenticed at restaurants in France and Italy before returning to New York where he landed a job as a line cook at Terrance Brennan’s Prix Fixe. He stayed there for almost two years, working his way through every station in the kitchen and forging a professional bond with Brennan’s Sous Chefs Joseph Fortunato and David Pasternak. In March 2004, Murphy opened his first solo enterprise with Landmarc [Tribeca], which won rave reviews both for its eclectic French and Italian menu as well as its highly untraditional wine list. Following its success, Murphy opened Ditch Plains in the West Village in 2006 serving casual, beach-style cuisine such as lobster rolls, fish tacos and the infamous ditch dog as well as other comfort food favorites. 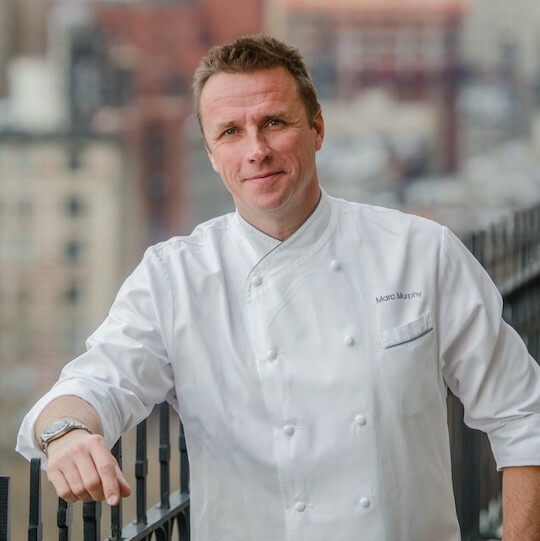 In 2007, Murphy was given the opportunity to open another Landmarc restaurant in the prestigious Time Warner Center where he brought his bistro-style cuisine midtown. Murphy’s restaurants now fall under the Benchmarc Restaurants by Marc Murphy name, where he acts as Executive Chef and Owner. In addition to the restaurants, Murphy also heads up the company’s catering division, Benchmarc Events by Marc Murphy, where his signature style of ac- cessible contemporary cuisine transcends the boundaries of what is offered in his restaurant locations. Today, Murphy’s involvement in the industry moves beyond the restaurants as well, with a regular role as a judge on The Food Network’s highest rated hits, CHOPPED and CHOPPED JUNIOR as well as appearances on CHOPPED AFTER HOURS, IRON CHEF AMERICA, GUYS’S GROCERY GAMES, BEAT BOBBY FLAY, WORST COOKS IN AMERICA, THE KITCHEN, UNIQUE EATS, THE BEST THING I EVER MADE, THE RACHAEL RAY SHOW, THE CHEW, GOOD MORNING AMERICA, THE TODAY SHOW and HSN among others. He is the President of the Manhattan chapter of the New York State Restaurant Association, both a board member and Food Council member of City Harvest, and a member of the Food + Finance High School’s Industry Advisory Board. Marc sits on the Leadership Council for Share our Strength’s No Kid Hungry campaign and has been a national spokesperson for Share Our Strength’s Dine Out For No Kid Hungry initiative. In 2012, Marc joined the U.S. Department of State’s Diplomatic Culinary Partnership, where he takes part in public diplomacy programs that engage foreign audiences abroad as well as those visiting the United States. He has traveled to Italy, China and Turkey as part of this program thus far. Marc is the Author of Season with Authority: Confident Home Cooking his debut cookbook which was released in April 2015 and continues to be a top seller.